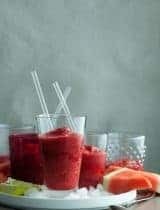 Hydrating watermelon and coconut water meet up with tangy lemons and tart raspberries in this refreshing and thirst-quenching watermelon, raspberry lemonade. It’s officially summer and that means watermelon season is in full swing. 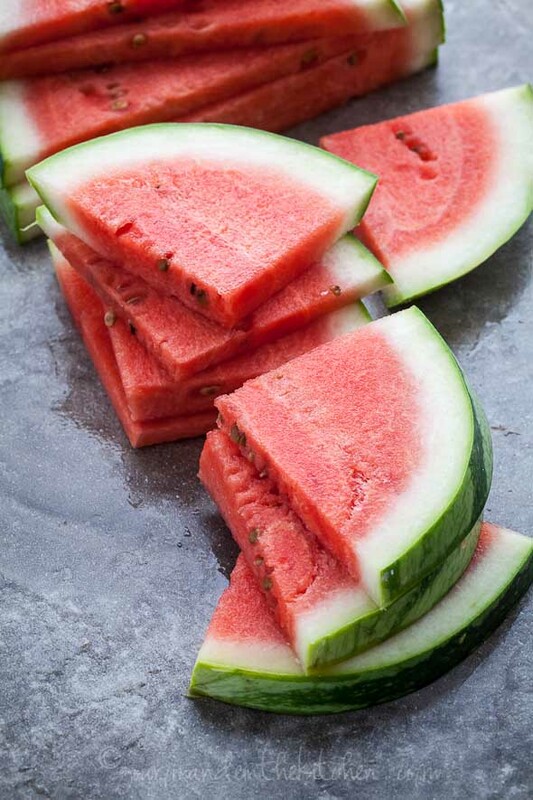 Ripe, juicy watermelons are truly something special and this is the season to enjoy the pretty pink-fleshed fruit. Summer of course is also lemonade season and I’m particularly partial to the tongue tickling tartness of fresh lemonade on a sweltering summer day. The perfect combination of sweet and tart, it’s like summer in a glass and a symbol of the season. 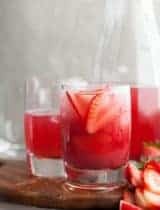 This tart pink watermelon raspberry lemonade is entirely naturally sweetened; there are no added sugars or sweeteners, only fresh fruit and coconut water. 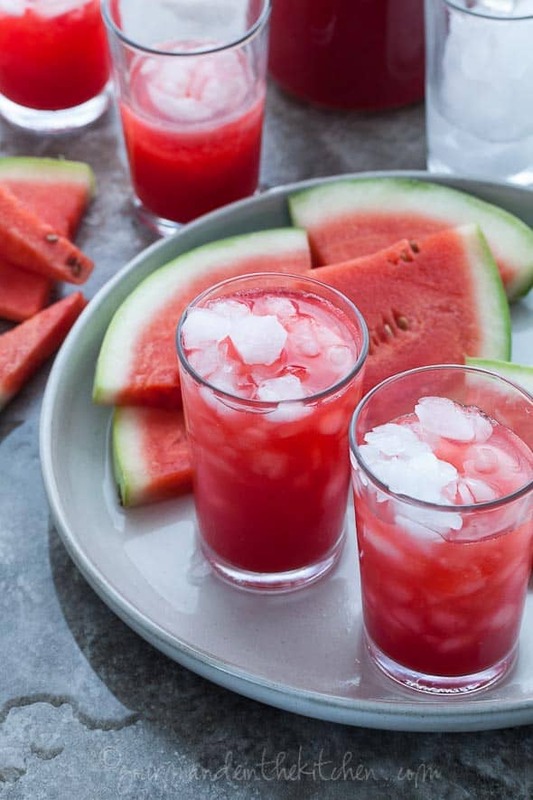 Cubes of juicy watermelon are whizzed together with raspberries and lemon juice and then added to naturally sweet and electrolyte-rich coconut water to create a lemonade that’s super hydrating and bright in both color and flavor. Due to their high water and potassium content, watermelons are a refreshingly tasty way to rehydrate when the temperature rises. While many people may know that tomatoes are a good source of lycopene, watermelons actually surpass them, giving us another great reason to enjoy them. Coconut water also packs the power of potassium and is a natural way to replenish electrolytes and rehydrate on a hot day. Add a pinch of mineral rich sea salt (like you would to the rim of a margarita glass) and you’ll have a thirst-quenching and all-natural post-hike or swim kind of drink. 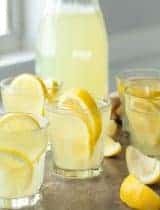 Best of all this cool refreshing lemonade comes together in minutes, which is a good thing since you’ll want to keep a pitcher handy in the fridge this summer. Press through a fine mesh filter to strain and transfer to a large pitcher. Add the coconut water (or plain water if using) and stir to combine. Pour over ice in glasses, top up with a little sparkling water for a fizzy version or a shot of vodka for a cocktail version. 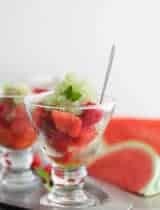 Finish each glass with a pinch of salt and garnish with slices of watermelon, raspberries or lemon wedges if desired and serve. Thanks I will try this today. How can I go wrong? 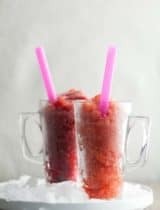 I love watermelon and have a TON on hand - need to make slushies or lemonade with it! Great thinking! Now that sounds refreshing, Sylvie! Love that there are no added sweeteners. This looks and sounds absolutely amazing Sylvie! Cheers!! I cannot think of a better summer drink, Sylvie! This looks so light, cool and refreshing. Lovely! How refreshing does this look?! Gorgeous! This sounds like such a fabulous treat! Wow! Splendid! I love all the gorgeous photos.I felt like going to market to get some watermelon right away. I am ready to sip this gorgeous lemonade on my porch! Love the raspberry with watermelon! 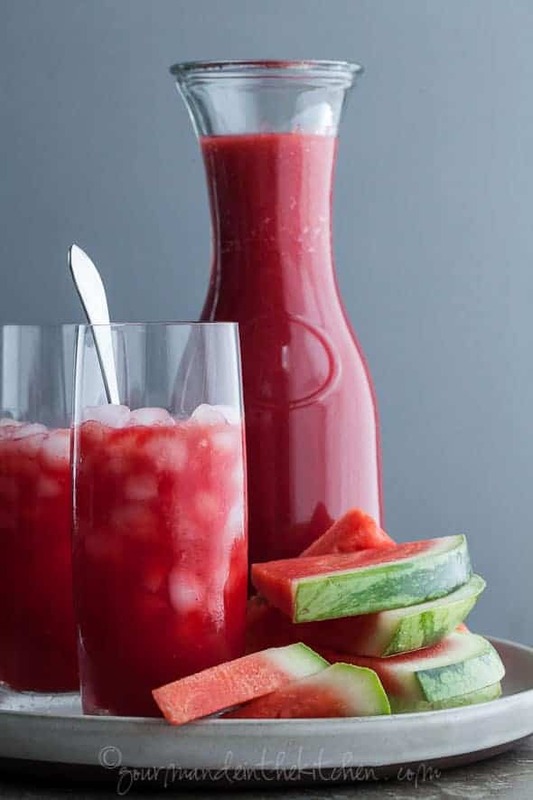 We have some watermelon juice in the fridge - soooo refreshing! Love the addition of coconut water and lemonade. I am loving the addition of coconut water in the drink! Cheers to summer and stay hydrated. What a lovely idea... so fresh, so refreshing! This looks so lovely!! I love the idea of using coconut water in this! 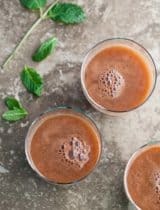 This looks so refreshing and is wayyy healthier than sugary sports drinks! Yum!! Whats not to love. You always inspire Sylvie...always! HUGS!! This looks fantastic! I'm definitely going to try it...soon. Your photos are tantalizing. It's humid today and I got so thirsty looking at your delicious watermelon raspberry lemonade - what a great combination!!! Love your 2nd picture, so pretty! 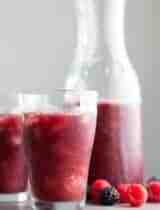 I have just pinned this recipe - it looks absolutely gorgeous and so thirst quenching. Who needs added sugar or syrups when you have fresh, sweet seasonal produce? I've got to get a watermelon ASAP! Wow! That looks amazingly refreshing! 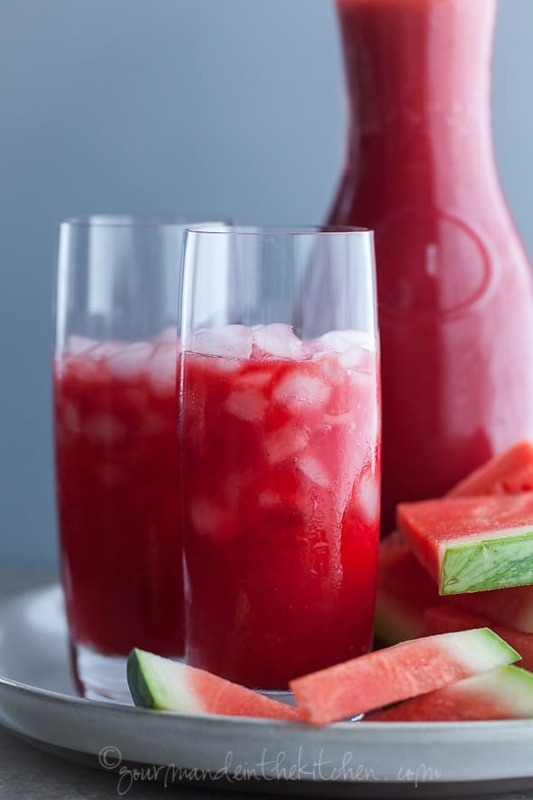 Coconut water makes this watermelon raspberry cooler even better! Sylvie, I absolutely love this refreshing combination! Happy 4th! I love the great photo! I never thought about combining watermelon with lemon or raspberries or coconut water. Tha't why I love your recipes! Can't wait to make it today. Thank you. I often struggle with drink photos but you make it look effortless! This sounds so refreshing and lovely for summer. Found this on Pinterest. Looks SO good, and refreshing. I love watermelon. We have a couple leftover from our 4th of July party and I'm looking to find more ways to use them up. Sylvie, Your lemonade combines some of my absolute favorite foods and it sounds wonderful and so refreshing! I have a peach lemonade recipe in my cookbook that uses coconut water and it's so good! I will be making your recipe this weekend. I love the combination of sweet and tart! And a little rum :) Just gorgeous! Refreshing indeed! I love these photos! Wonderful! What coconut water do you use? Do you make your own? Thanks for this recipe!!! Either one works great but fresh is even better! I can never get enough lemonade and I am adoring the flavors in here. Yum! 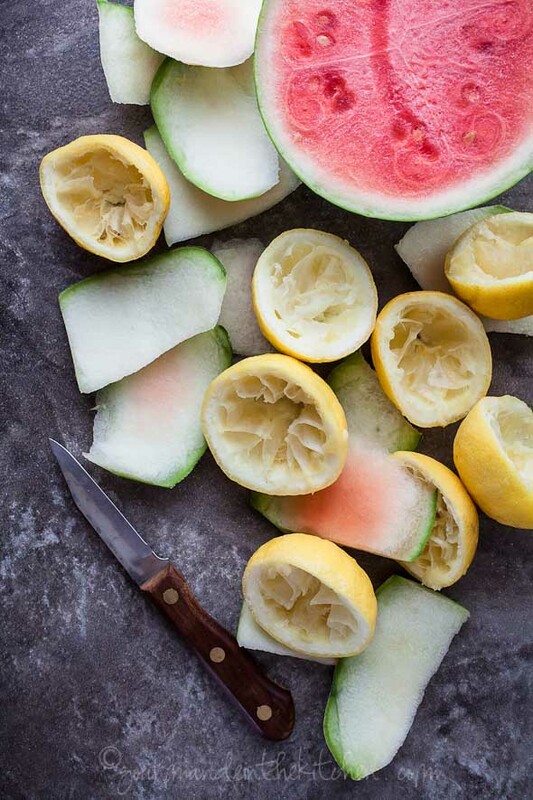 I eat watermelon almost every day this time of year and I love the idea of watermelon and lemonade together. Thanks for a great refreshing summer treat! absolutely, hands down the most amazing, beautiful and vibrant looking drink I HAVE EVER SEEN! What brilliant colours and freshness the recipe has! Oh what a glorious colour! You've just reminded me that I have yet to have my first watermelon of the season - a situation that I need to rectify. Been seeing a lot of talk about coconut water but have never tried it for myself - is it as strongly coconut flavoured as the milk? Not at all, it's actually pretty hard to describe the taste of coconut water. I'd say it's slightly sweet with a faint hint of nuttiness but if you didn't know what it was you'd be hard pressed to pin it down as coconut. I made this today and took to the beach to share with my friends, delicious and perfect for a very hot day ! Your photography is really fantastic and I am especially impressed with the way you light glass, I know this isn't easy (or at least I don't find it easy :-)). This looks so refreshing and fresh! Perfect for hot weather. Can you make this the day before serving?